Simply go to "Import/Export Build" > Click the "Import from Pastebin" paste the link in there, and then click "Import"
1. If you are looking for a build that makes end-game bosses a joke. 2. If you are just that cool that you have to play a cold oriented build. 3. If the build you seek can start with a very low budget with possible upgrades with more currency. 4. If you like to play a CI build for the first time. The build utilizes Chaos Inoculation which makes you 100% immune to all sources of chaos damage including poison. However, you'll have 1 HP and therefor need to cover yourself with Energy Shield alone. This is not suggested for early levels and this guide will cover the transition and workarounds to get yourself to CI. Besides this the build slows enemies down and utilizes a massive eHP pool to be as tanky as possible. For higher budget builds you can also throw in Temporal Chains allowing for even more slow effects on enemies. Since the builds defensive design requires you to not take damage for about 1 second to start your energy shield recharge, this allows you to be immune to burning ground effects. This setup is designed to increase cold damage taken by bosses and to use the Vaal version to speed up the map clearing speed. It is VERY important that they are linked in the order described above, the craft "Trigger socketed spell when you use a skill" puts the ability on a 4 second CD and will be cast in the order of the links. This is used to provide cold resistance exposure (-25% cold res) debuff on enemies via Frost Bomb whilst the Storm Brand & Orb of Storms are consistently hitting enemies with Lightning damage making sure the enemies have lower Cold resistances via Elemental Equilibrium this makes it very important that you do NOT, EVER, get any sort of FLAT added cold damage on your tree or gear (%increased is fine, just not # added cold) as that will ruin this setup. The lvl of CWDT is suppose to be low, this comes down to a matter of taste, I prefer to keep it at lvl 3 with the Immortal Call at lvl 5, if it's higher it won't work. It also does not require Endurance Charges to function though the duration will be rather low without which is still enough to keep you from getting instantly killed by Porcupine packs that dies! If you play a high budget version you can run Blasphemy + Temporal Chains if you have a Solstice Vigil equipped! As this build is a CI build and an Occultist is it important to always start with Wicker Ward then Vile Bastion. When these 2 nodes are picked up you're able to reach comfortable energy shield numbers for your CI switch explained in the lvling trees below. The other 2 ascendancy nodes you're gonna want to take are pure damage increasers in the form of: Void Beacon then Frigid Wake! * As this is a CI build it is very important to understand that you're gonna have to level the build up as either pure life based or hybrid utilizing both Life & Energy Shield as your sources for effective HP. To follow the leveling trees blindly is not always ideal as the video describes: it all depends on how comfortable you are with your character based of the gear you've found / have equipped. The leveling trees are generically designed to fit most situations though. Always keep your elemental resistances at 75%+ after act 6 (preferably before if possible). * You will need to spend some regret orbs when you do the "transition"
* Never pick up Elemental Equilibrium unless you have a weapon with the craft "Trigger socketed spell when you use a skill" or you'll do next to 0 damage. * You're most likely going to need assistance with attributes from a rare amulet and/or the +30 Dexterity & Strength nodes left of the witch area as shown in the finalized tree. This usually doesn't become an issue unless you go with high budget items such as the Solstice Vigil. 1. Freezing Pulse till you reach lvl 12 at which point you'll get yourself a Storm Brand and later in Act 2, pick up Brand Recall. This will carry you all the way to lvl 70 and beyond if you wish till you're ready to transition to CI / Vortex. 2. Items such as Goldrim, Lifesprig, Wanderlust helps a lot to speed up the leveling process. 3. If you get a Tabula Rasa early on you're gucci all the way! The craft "Trigger socketed spell when you use a skill" puts the ability on a 4 second CD and will be cast in the order of the links. This is used to provide cold resistance exposure (-25% cold res) debuff on enemies via Frost Bomb whilst the Storm Brand & Orb of Storms are consistently hitting enemies with Lightning damage making sure the enemies have lower Cold resistances via Elemental Equilibrium this makes it very important that you do NOT, EVER, get any sort of FLAT added cold damage on your tree or gear (%increased is fine, just not # added cold) as that will ruin this setup. The build can use the Fenumus unique set items or simply use rare items in all slots. It has a tonne of possibilities allowing you to approach the build in an extremely cheap manner. I would strongly suggest to use the Aegis Aurora shield due to the defensive layers it applies vs the harder end-game bosses such as deeper delve lvl Aul as well as Shaper & Uber Elder. Besides this it is important to note that the build doesn't need more than ~300-350k Shaper DPS to handle Uber Elder smoothly which makes the weapon the only real important piece which will allow for Elemental Equilibrium to be used which significantly increases your damage output. With that "threshold" reached you only need to focus on getting as tanky as your budget allows which can be anything from a couple of chaos to hundreds of exalted orbs. There really is no direct roof to what you can do with this build! The use of Solstice Vigil allows you to use a Blasphemy + Temporal Chains setup! Other styles of higher budget would include the bestiary Spider craft allowing that to be used which will require mana reservation tricks from the tree and/or specific items crafted or unique or even higher lvl Enlighten to allow for that approach, this not only increases the defensive layers a bit but also increases your damage dealt significantly. Before you start posting questions I would recommend checking the video. I am as always available in my stream! Please note that since I'm not a fulltime streamer, it has become impossible for me to keep up with responding to ALL my forum threads. However, I am ALWAYS answering questions posted in the YouTube video, my discord, twitter, instagram & twitch! But seriously now, good advice with the order of the gems in the weapon. It doesn't matter if storm brand or orb of storms will be first right ? 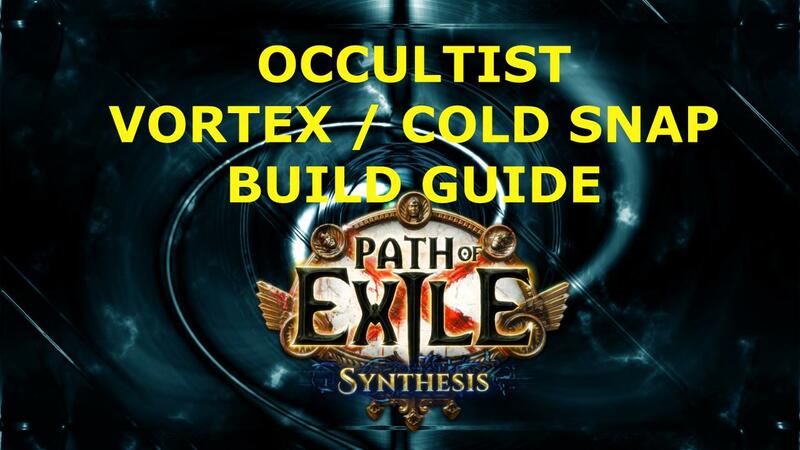 Pretty awesome build guide, Vortex/CS is a real smooth skill and plenty of bossing potential. This is my gear thus far, always looking to min-max little things though. Any idea what equipment I can get to push this build further? Atm I'm always on the look out for a really good new wand/sceptre. Also plan to improve my Regalia but comfortably sitting at 10.5k ES. Also have a Malevolence ES Regen + Cold DoT watcher's eye. Love this build so much too! I have one question, I'm not using any curse (don't have amulet) - but if I would have one, is there something wrong with frostbite over temporal chains? Or is it simply because we don't need more damage...? Thanks in advance and keep up that amazing builds!